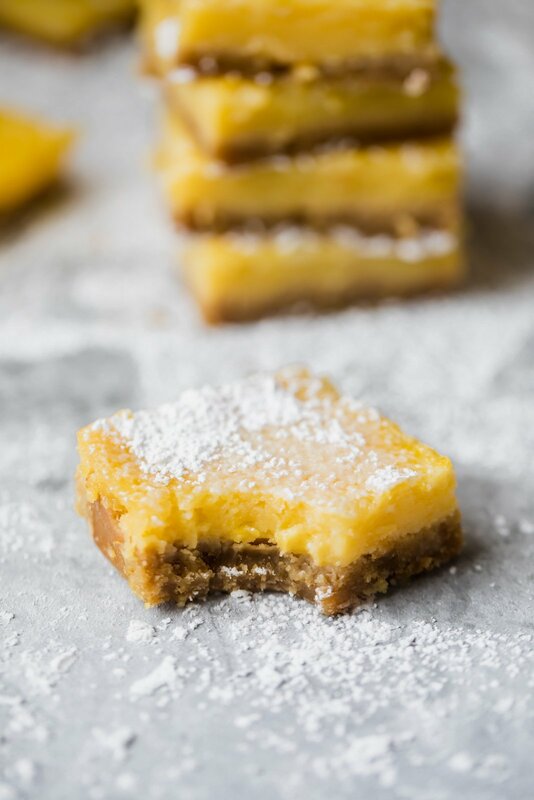 Healthy lemon bars that are gluten free, dairy free and paleo! The crust is made with a mix of almond flour and coconut flour and the light lemon filling is made with just 4 simple ingredients: fresh lemon juice, honey, eggs and coconut flour. You’re going to LOVE these easy to make bars — they’re great for parties! When we first moved into our condo here in Chicago, the previous owner left a janky metal patio table and chairs for us. We enjoyed it for a good year and then realized that the table was started to rust and look a little obscene. Finally a few weeks ago, I made it my mission to recreate our patio. First on my list was making sure that it was cozy, which meant a sectional was of the utmost importance. Secondly, we needed a place to enjoy our dinners, so we opted for a cute bar bistro patio set. Lastly, PLANTS! We’ve really been enjoying planting flowers and palms; nothing crazy though, as we want to make sure they actually survive. What are your favorite outdoor plants? I’ll do a before and after of everything soon and once everything is completely I cannot wait to host a patio dinner party ASAP! And guess what I’ll be making for dessert? These lovely healthy lemon bars. Uhhh huhh honey. 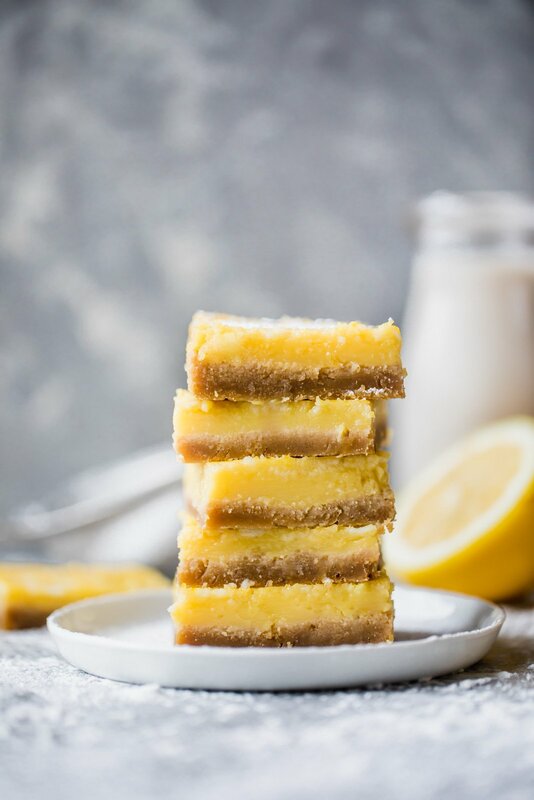 Does anyone else think of lemon bars as a must make dessert for Memorial Day weekend? Maybe it’s just me, but growing up we always enjoyed strawberry shortcake and lemon bars for dessert. Most of the desserts I had growing up were out of the box, unless it was Dad’s cake or Grandma’s homemade lemon pie, but I must say that there’s a special feeling that comes with baking something yourself. Perhaps it’s a sense of pride and accomplishment. Whatever the case, desserts almost always tastes better when it’s homemade. So, what do you say? Are you putting these lemon bars on your weekend baking list or what? I SAY YASSSSS. 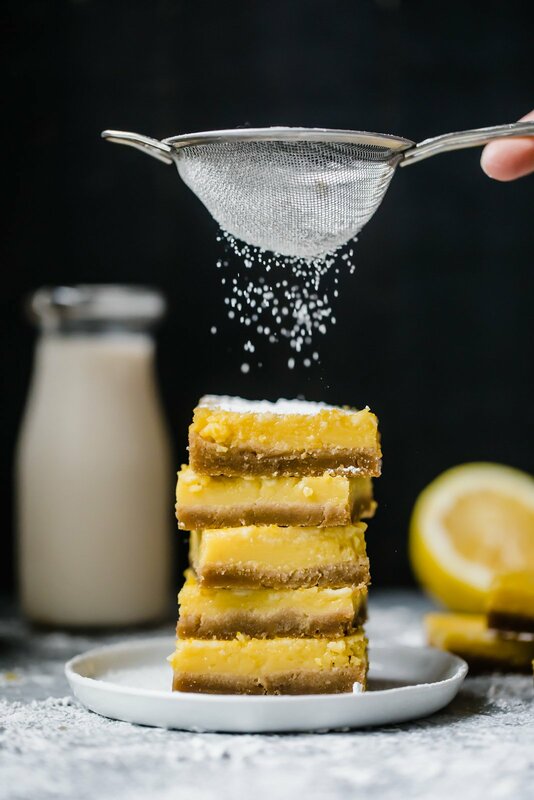 These healthy lemon bars are made with super simple ingredients and are naturally sweetened with both honey and coconut sugar (but don’t worry, you’ve got options!). The ‘shortbread’ crust is made with almond and coconut flour. I tested them a few ways, but felt that it was best to use a mix of both flours for a crust that didn’t get soggy. The filling is made with just 4 ingredients. Just whisk together lemon zest, fresh lemon juice (yes, it must be fresh! ), eggs, egg yolk, honey and coconut flour in a bowl until smooth. Then bake away! A few hours after the bars chill, you’ll have magic on your hands. They’re perfectly sweet and made for all you lemon lovers. If you make this recipe, be sure to tag #ambitiouskitchen on Instagram, and leave a comment + rate the recipe below. It helps Ambitious Kitchen readers! Thank you. xo. 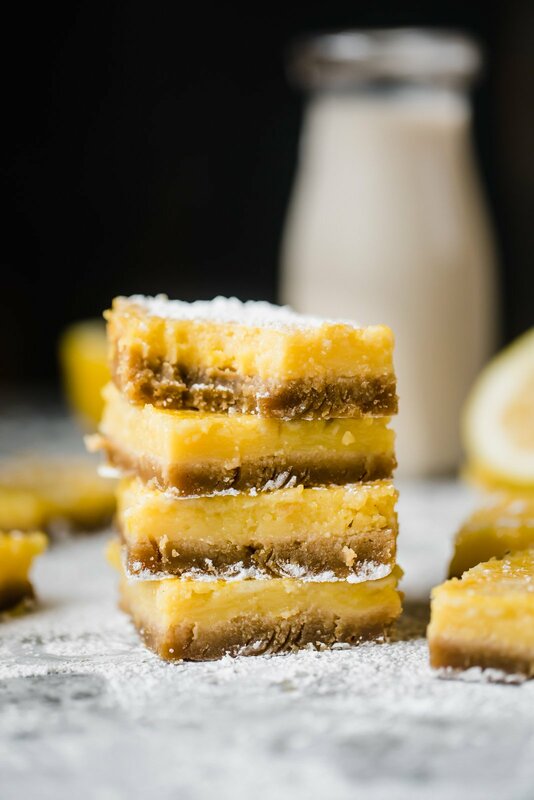 Healthy lemon bars that are gluten free, dairy free and paleo! The crust is made with a mix of almond flour and coconut flour and the light lemon filling is made with just 4 simple ingredients: fresh lemon juice, honey, eggs and coconut flour. You're going to LOVE these easy to make bars. First make the crust: In a medium bowl, add in the coconut oil, coconut sugar, egg and almond extract. Mix together until smooth. Add in almond flour, coconut flour and salt. Mix again until a dough forms. Press dough evenly into prepared pan with your hands. Bake for 10 minutes, then remove from oven and allow to cool for two minutes. While your crust bakes, you can make the filling: In a medium bowl, whisk together the lemon zest, lemon juice, honey, eggs, egg yolk and coconut flour. Pour over warm crust. Bake for 18-25 minutes or until filling is set and no longer jiggles. Cool completely on a wire rack then refrigerate for at least 4 hours to firm up bars. Once ready to serve, use a sharp knife to cut into 12 bars. I recommend garnishing them with powdered sugar and a little lemon zest before serving. Enjoy! 93 Responses to "Healthy Lemon Bars (gluten free, dairy free & paleo!)" What other flours can be used besides almond flour? Ccan one use the equivalent in coconut flour or regular flour if not needed to be gluten free? You could try using more coconut flour, but I’d suggest using more oil – about 1/3 to 1/2 cup! Could I use coconut flour instead of almond flour? my boyfriend LOVES lemon but has a nut allergy. Hi Megan! You could try using more coconut flour, but I’d suggest using more oil – about 1/3 to 1/2 cup. These sound amazing!! Lemon is so refreshing during the summer! I thought these were dairy free… Eggs are dairy. 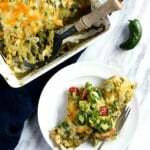 I found a decent egg replacement and used it in this recipe! Not sure if the consistency is right, but it sure is yummy! Both Bob’s Red Mill egg replacer and Ener-G egg replacer were successful substitutions! Perfect – glad those worked out for you! Do you think using more maple syrup in place of the honey would work? I can’t have honey right now but these look delicious. These look so delicious! And I love that everyone can enjoy them, dairy or gluten free! These just might show up this weekend on Memorial Day. yum can’t wait to make these! The perfect spring/summer recipe. I can’t believe it’s already almost Memorial Day! I bet your new patio looks awesome! It would be perfect for a Memorial Day party. These lemon bars look fabulous! I have always loved lemon bars as a kid. They were too delicious! 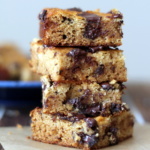 These look unreal and I have almost all the ingredients! 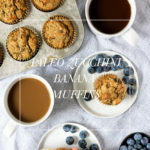 Could I use vanilla extract instead of almond? Or do you think the almond is necessary…? Perfect! You can definitely use vanilla extract – it will just change the flavor a bit (i.e. it won’t have an almond flavor). I made these this afternoon. Beyond amazing!! But wondering what the consistency of the filling should exactly be? thank you!!! Delicious lemon bars gluten free, dairy free I am so amazed. How many yolks go in the filling? 5 or 1 + 4 egg whites? 4 full eggs + 1 additional egg yolk! These were so delicious, but in the middle of my pan the crust came up through the filling and the filling was on the bottom – in some places the crust was also between 2 layers of filling. Suggestions? I followed the recipe pretty carefully, but the visual presentation wasn’t great, ha! Very strange! I would make sure your crust has cooled for a couple minutes before adding the filling – that might help it “set” a bit more. Glad you liked them regardless! How many days ahead of my event can these lucious be made? Oops trying again, I’ve got lots on the brain. How many days ahead of my event can I make these luscious lemon bars? I would make them the day before and keep them in the fridge! 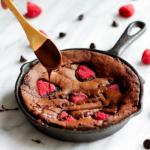 What type of baking pan did you use other than a glass one? Metal? How do you prevent the lemon liquid from seeping into the crust? When I made these, the liquid seeped through the crust so there was no separation of the two layers, it just ended up being one soggy mess. FYI, I cooked the crust crispy before adding the lemon liquid. Hi Inga! Very strange – I haven’t had this issue making them. Did the crust cool completely? I would make sure the crust is still warm when you add the lemon filling on top (I just let it cool for a couple of minutes). When the bar is finished, is the crust crunchy or soft? It’s soft like a sugar cookie! Followed the recipe (just with vanilla extract instead of almond) and they turned out amazing! The pan was devoured within a day. I loved the filling so much, I may double it next time! approximately how many days should these last before spoiling? LOVE EVERYTHING ON UR SITE BTW😍. Hi! These sound great, I might make them for a family lunch! Can I substitute coconut flour with almond flour? Hi Tatiana! The coconut flour helps the crust hold together, so I wouldn’t swap it with more almond flour. Can I sub almond flour for all-purpose flour? I wouldn’t recommend swapping the flours in here – the consistency will be very different! Hi Niki! Thanks so much for your comment 🙂 Glad you loved these and are finding tons more that you love, too! Thank you the recipe! I made it yesterday and it was delicious. My crust was a little bit different, but OK. I used erythriol instead of honey and maple syrup because those are not paleo. I’ve never baked with erythriol, so that might be what changed up the crust! Just checked it out – the video should be working correctly! Hi Monique, these are amazing but for some reason when I let mine cool after the filling is no longer wobbly, it starts to crack big time. How can I prevent this from happening? Hi Georgie! This usually happens when you refrigerate the bars while they are still slightly warm! Can you make this without lemon zest? The lemon flavor won’t be as strong, but it will still work. Very Disappointing recipe…..it is just not a good crust or filling. I am a pastry chef by trade, Paleo by my mutation ( not able to digest and process gluten and carbs). The crust is very grainy, like you can taste the ingredient separately, very unpleasant mouth feel. As for the filling, almond extract is not complementing the overall taste. Vanilla or coconut extract would be better. Meyer lemons would be a better choice, I felt like I had been slapped by a raw & bitter citrus police. I think the sweet to lemon ratio should be equal amounts. I will not attempt this recipe again. Sorry to hear that, Sherry! I’ve made this one many times with success and have never encountered those issues. Does anyone know if almond flour is ground up blanched almonds or the dried up grounds that are leftover from making almond milk? Followed instructions carefully cooling crust for 2 minutes but the crust still rose up in the pan and the top layer became the bottom layer. Frustrating! I’m sorry you had an issue. I’ve never had this happen to me! Perhaps wait 5 minutes. Can I substitute the sweetener with either Stevia powder, Stevia Drops, or Erythritol powder? Can I substitute the sweetener with Stevia drops, Stevia powder, or Erythritol powder? If so, what would be the quantity to use? Thanks. I don’t typically bake with alternative sweeteners, so I’m not 100% sure. Let me know if you try it! Did I do something wrong? The liquid and crust sort of melded together and the crust is soft and rubbery, like the filling soaked in or spilled over. Followed all directions to the T. Still yummy! I’m so sorry you had such an issue! It sounds like maybe it wasn’t baked long enough in the first place. I plan on retesting this recipe soon and will report back! How important is the parchment paper? I typically just bake items directly in the pan. Also, for the coconut sugar, do you use the dark brown, or the white? I just put mine in the oven, and within moments of pouring the filling over the crust, the crust started bubbling up. Kinda bummed, because I’m experimenting with this for a bridal shower where the bride must be GF and DF. Hope my second try doesn’t do that.